I am a co-founder and the Chief Technology Officer of Locomation, a provider of safe and reliable automated driving technology for ground transportation industry. Prior to Locomation, I was a Special Faculty / Commercialization Specialist at the National Robotics Engineering Center (NREC) of the Robotics Institute at Carnegie Mellon University, where I'd started working as a Senior Robotics Engineer. For more information, you can review my resume. Prior to that, I was a Postdoctoral Fellow at the Human-Computer Interaction Institute at Carnegie Mellon University. I had been leading the efforts on building intuitive and expressive interfaces to interact with semi-autonomous robotic systems that are intended to assist elderly and disabled. Before joining the Human-Computer Interaction Institute, I was a Postdoctoral Fellow at the Robotics Institute at Carnegie Mellon University. My primary affiliation was with the National Robotics Engineering Center (NREC) as a member of the Tartan Rescue Team working on the CHIMP robot for the DARPA Robotics Challenge. I was also affiliated with the Personal Robotics Lab, leading the Assistive Dexterous Arm (ADA) project in the assistive robotics domain. I received my Ph.D. from the Department of Computer Engineering at Boğaziçi University, Istanbul, Turkey in 2014. My thesis work contributed a case-based mobile manipulation framework. I was supervised by Prof. H. Levent Akin from Boğaziçi University and Prof. Manuela Veloso from Carnegie Mellon University. From July 2011 to January 2012, I was a visiting scholar in the Computer Science Department at Carnegie Mellon University, working under the supervision of Prof. Manuela Veloso as a member of the CORAL research group. I got my MSCS degree from the Department of Computer Science at The University of Texas at Austin, and my BS degree from the Department of Computer Engineering at Marmara University, Istanbul, Turkey. Best paper award in Computer Science Student Workshop 2013 (CSW'13). Programme 2214 Scholarship of The Scientific and Technological Research Council of Turkey (TÜBİTAK). Best reviewer award in Computer Science Student Workshop 2010 (CSW'10). Best research paper award in Computer Science Student Workshop 2010 (CSW'10). Completed undergraduate study with the second highest GPA and holding a high-honors degree. First place in RoboCup'05 4-Legged League Technical Challenges as a member of team Cerberus. Organizing Committee member of the Intelligent Robotic Systems Workshop at AAAI 2013. Organizing Committee member of the AAAI 2012 Fall Symposium: Robots Learning Interactively from Human Teachers (RLIHT). Member of the RoboCup Federation Internal Advisory Board. General Co-chair of the RoboCup 2011 event, which was held in Istanbul, Turkey. Founding member of the Turkish National RoboCup Committee. Local chair of the Organizing Committee of the Standard Platform League of RoboCup 2011. Technical Committee member of the Standard Platform League of RoboCup from 2009 to 2012. Member of the Team Cappadocia, the winner of the 4th place in the MAGIC 2010 competition. Computer programming instructor of the FESTO & Boğaziçi University Mechatronics Specialist Certification Program. Member of Cerberus, the RoboCup Standard Platform League Team of Boğaziçi University and the winner of the technical challenges in RoboCup'05. Captain of the team from 2008 to 2010. Member of the SPL Organizing Committee of the RoboCup Mediterranean Open event between 2010 and 2012. Publication co-chair of the Computer Science Student Workshop (CSW) in 2011 and 2012. Workshop co-chair of the 1st Computer Science Student Workshop 2010 (CSW'10). Teaching Assistant of the CmpE 49A - Introduction to Robotics course, taught by Prof. Levent Akın, in Fall 2009-Fall 2011. Referee (2009) and jury member (2011, 2013) in the FIRST LEGO League Turkey Tournaments. Local Organizing Committee member of CLAWAR 2009. Member of LARG (Learning Agents Research Group) led by Dr. Peter Stone between 2005 and 2007. Member of Austin Robot Technology & UT Austin DARPA Urban Challenge Team in 2007. Member of the robot soccer lab and the UT Austin Villa RoboCup 4-Legged League team between 2005 and 2007. Teaching Assistant of the CS378 - Autonomous Vehicles: Driving in Traffic class taught by Dr. Peter Stone during Spring 2007. Teaching Assistant of the CS307 - Foundations of Computer Science class taught by Mike Scott at UTCS during Fall 2006. Research Assistant of Dr. Peter Stone during Spring 2006. Here is the link for the homepage of my elder brother, Çetin Meriçli. 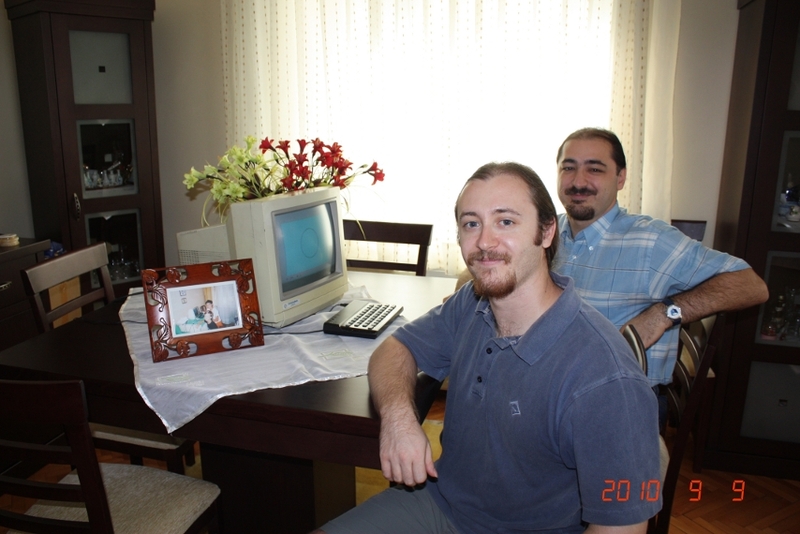 09.09.1990 - Two of the most important computer scientists and roboticists, Meriçli Brothers, in front of their Sinclair ZX Spectrum computer. 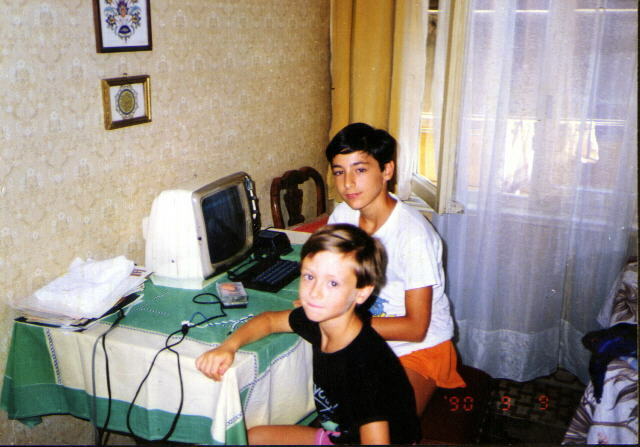 09.09.2010 - My brother and me in front of our Sinclair ZX Spectrum computer again 20 years later.